D. H. Lawrence completed his play The Daughter-in-Law in 1913, the same year in which he published Sons and Lovers, and one year after the miners’ strike which had split the mining workforce in the Nottinghamshire coalfields, particularly in the Eastwood Colliery (Lawrence was born in Eastwood). The play was never performed whilst he was alive, only opening in 1967 at The Royal Court. Before then he had written A Collier’s Friday Night (1906), containing some of the ingredients of Lawrence’s continuing concerns as a writer: a struggling mining family whose main wage-earner drinks, is despised, and against whom the rest of the family struggle to find some sense of identity and purpose. Since The Daughter-in-Law was performed in 1967, it has become more widely known but still deserves more attention. It is, therefore, fortunate, to be able to see this production by the Library Theatre, under the skilful direction of Chris Honer, on the stage of The Quays Theatre at The Lowry. 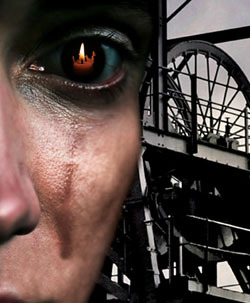 It is subtly acted by a cast that captures, with humour, pathos and sensitivity, the underlying dramatic tensions, the unresolved problems and deep personal and social conflicts, of a story set within the immediate neighbourhood of a Nottinghamshire mining family in the early years of the twentieth century. Lawrence was a fine playwright with a strong sense of dramatic tension. There are five main characters, three female and two male roles, with a sixth small entrance part for a Cabman played for all its worth with a beautifully dismissive finger gesture by Max Calandrew. It takes some doing to be on stage for a few seconds and yet make a mark. The setting is mainly the kitchen of the house of the newly married Luther and Minnie Gascoigne, with an important opening scene in the family home of Luther’s mother. 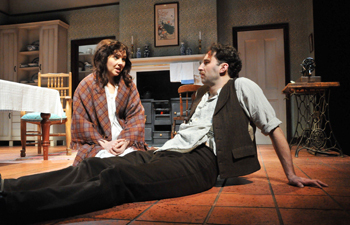 The focus of the drama is entirely upon the interaction of the characters on stage, whilst significant off-stage events involving these characters, including the bitterness of the colliery dispute, intervene. The main event, which has taken place before the play begins, overshadows all that happens. 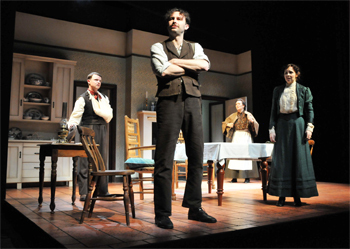 The set is skilfully shaped at The Lowry for this production to reflect a collier’s world in the early years of the twentieth century and it revolves around the fact that there are two Mrs Gascoigne’s in this play, the mother and daughter-in-law. The mother of Luther and Joe, played shrewdly and with much subtle humour by Diane Fletcher, is a dogged, worldly-wise, proud, determined woman who is amazingly adaptable in her tortuous ‘defence’ of the sons she knows, or likes to think, to be almost totally incapable of making their own decisions. With an air of unruffled prudence, common sense and worldly wisdom, the mother of Luther and Joe has the air of a woman capable of accepting anything under the sun so long as the status quo is not unduly sullied. The initial view of her kitchen captures the authenticity of a tidy, deliberate and economical working-class ethic. It has its own standards of good taste and simplicity. 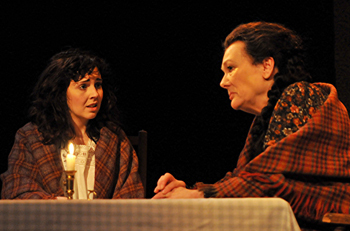 Then there is the daughter-in-law, Minnie, played with great versatility by Natalie Grady. This is a miniature tour-de-force of performance revealing strong and sensitive mood swings and swift responses to the unfolding drama. Minnie refuses to be the stereotypical young bride, reflecting far more the strong, but vulnerable, female personality that figures so often in the work of D. H. Lawrence and yet struggling, too, with inherited values that would identify her with her social context. In many ways she has to battle to assert her identity, her aspirations and the complexities of her response, as the action develops, for she clearly, and strongly in this performance, reveals her desire to break out of the mould of her class and marriage, to make of the clumsy Luther someone worthy of her dreams. Subtle changes with lighter pastel-coloured, tasteful décor for the kitchen of Minnie and Luther, compared with that of Luther’s mother, reflect a different kind of order in the furnishings. Minnie is clearly establishing the protocols that, as a young wife, she hopes to establish for her husband to follow. There is a significant point, in the second half of the play, when Minnie returns from her trip to Manchester, dressed in a coat, costume and pill-box hat which suit her entirely and which momentarily highlight the grandeur of her ambitions compared with her own domestic surroundings. She enters the stage attired as if for an Edwardian costume drama. The colour of her costume matches exactly, the colours of what appear as a peacock’s fan tail in a Japanese print mounted above the fire-range on the rear wall. The moment powerfully reveals the contrast between her aspirations and the level on which she perceives her husband Luther to exist and the incongruity emphasises the chasm between their personalities. The often begrimed face of Luther, untidy, dishevelled, mostly with shirt loosely hanging out, repels her: Minnie sees herself caught in a relationship that portends disaster. The peacock green of Minnie’s costume reflected in the wall-picture was just one of numerous instances where the silent language of symbols underpinned a social war taking place on stage between the female characters. The pouting expressions of Mrs Gascoigne and Mrs Purdy, shaping up to one another, as the errant son Luther’s story is unfolded, is matched by an almost total lack of eye contact. Their facial expressions speak of aspirations to moral rectitude and superiority that, in the comic frame, almost distract from the seriousness of the news. Susan Twist as Mrs Purdy appeared in long, black, shroud-like clothing and bonnet, reminiscent of one of those distantly remembered and terrifying primary school teachers of years ago, employed to devour children. Only her spotless white apron, like that of Mrs Gascoigne, indicates the domestic focus of life for the women in the colliery world at this time. Mrs Purdy, however, is more like an Old Mother Riley figure with her dreaded fixed expression, as she tells the tale of her own daughter. There is humour and deep poignancy in this scene and one sensed the audience’s response to the humour, yet not entirely wanting to laugh with it. Someone, off-stage, not to be heard, was suffering as the mother recounted the reason for her visit to the home of Mrs Gascoigne. It takes skill to manage such tension and this production controlled it well. The programme to this production usefully reproduces an essay by Richard Eyre (since knighted) from The Guardian (11th Sept. 2002) in which we are reminded how much Lawrence felt his plays were breaking new ground by focusing upon working-class life. In some respects one could add to this the power of previously established figures in the world of theatre for whom working-class issues seemed not to match the expected grandeur of classic tragic drama. George Bernard Shaw is an exception, of course; but Lawrence turned his back on the established figures. Indeed, whilst watching the performance I was at times reminded more of Sean O’Casey’s Juno and the Paycock because in both playwrights, Lawrence and O’Casey, we hear an authentic speaking voice, issues of power, dependency, deceptions and fears shot through with a humour that is almost unselfconscious against social and political conditions beyond the stage that, by their very absence, are powerfully present controlling forces in the social situation of the stage. The intimacy and indeed simplicity of the setting emphasises the carefully underpinned complexity of the narrative. The key dramatic concerns of Lawrence’s play embrace a family caught within a set of emotionally charged aspirations dictated by a desperate desire to be ‘better than the rest’ whilst, all the time, controlled by the little income they have at their disposal. It is right to emphasise that this is a play, not a novel; yet in key instances the play is a dramatized vignette of central concerns of D. H. Lawrence both as playwright and novelist. The play has its own Mrs Morel, a despised mining husband, the frustrations and anger that erupt when human desire and passion conflict with a morality borne out of social and economic necessity (Sons and Lovers). Minnie Gascoigne expresses social aspirations which lead her by turns to despise and pity her husband Luther. The authority of the mother-figure, Mrs Gascoigne, in a working-class family with menfolk seemingly incapable of independent thought, only serves to exacerbate the irreconcilable tension between the power of personal desire and the impossibility of personal choice when money is scarce. The play explores the deceptions within all this, the need to ‘keep up appearances’, to retain a suggestion of rectitude and moral responsibility within a class system whose economics effectively deny choice, but within which individuals struggle towards a compromise with the heroism they are always denied. All these roles are played with conviction. Joe Gascoigne (played by Paul Simpson with a range of detached comic intent) brings just a touch of the rebellious which will characterise a number of Lawrence’s male protagonists, not least the tortured Paul Morel in Sons and Lovers. Minnie Gascoigne, wife to Luther, tantalisingly suggests later figures like the women in The Rainbow – women who, in Lawrence’s novel, “looked out … to the spoken world beyond …. aware of the lips and the mind of the world speaking and giving utterance” (this, of course, reminds us of the young Jane Eyre in Chapter 12 of Charlotte Brontë’s novel, too). Lawrence was, in this powerful opening chapter of The Rainbow, to suggest a biblical type of descriptive narration which would transfer the word-painting vocabulary of nature found in a novelist like George Eliot, into new ways of describing the inner aspirations of people, the floods, valleys and steeps of the inner world. And Minnie suggests that aspirational figure reaching out for a new kind of liberation whilst (and this is a powerful final moment of this production) growing into another Mrs Gascoigne, not yet able to reach to the beyond, needing to possess the man who is also for her the son of his mother still. The narrative comes full circle as the new generation replicates the conditions and relationships of the old. When, finally, the man she has come to despise, arrives back from the social upheaval of the conflicts surrounding the mine, bruised, battered, needing help like a child, then she can possess him. At that point the potential for pathos borders on the pathetic as Luther accepts the role assigned him. MINNIE: What did you marry me for? LUTHER: 'Cos tha axed me. The performance of Luther is compelling as the portrayal of a man emasculated, incapable of thinking for himself, and it is the difference between men and women, faced with the responsibility of decision and choice, that lies at the heart of this play just as it is found in so much of Lawrence’s writing. At times Luther smoulders with an inner rage; mostly he capitulates to his own insecurities. The Quays theatre at The Lowry makes full use of the apron projecting outwards into the auditorium in this production. Much of the action takes place in the brightly lit central and backstage interior which has its own power positions. When Luther loses the plot at various points, he comes to the forefront of the apron frequently and at those moments one finds the narrative uncomfortably close. Indeed, it can suggest something quite powerful about this production: the play is not simply located within a specific place or time in England. It is dealing with disturbing and important issues about human relationships that reach beyond its time to any audience. When Minnie looks out towards the auditorium at the end, she both locks into the central paradox of her life with Luther. In law she is his wife; within her soul she remains insecure as she reaches out into the world beyond the stage. The men are damaged by upbringing and social expectation, physically maimed by accident or drink or lack of economic security; the women are damaged by the men in their world. They are all damaged by the social constraints that dictate their lives, the fundamental poverty of the mining community, the injustices that sustained that poverty, the frustrations of passions and dreams that had to be contained within these insoluble constraints in law. Good writing, good art, leaves us sometimes with more questions than answers. I left wondering what the story of Bertha Purdy’s life and commitments would have been, what she would have said, what life she lived beyond the stage - she the unseen, unheard victim of all of this, like so many others of her own and other generations. Well worth seeing. The Daughter-in-Law by D. H. Lawrence, Directed by Chris Honer, Produced by The Library Theatre Company at The Lowry 23/2/12 – 10/03/12.